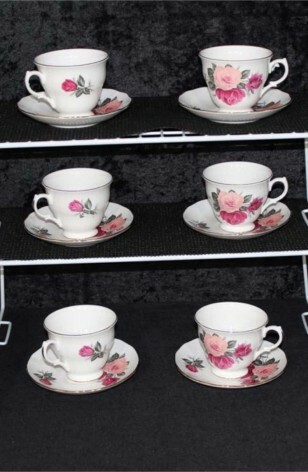 Vintage - Beautiful Gainsborough Bone China Pieces in the Peach & Red Rose (H 37 7) Pattern. Made in England for a short period of 1952 through 1955. (18) Pieces consisting of (6) Trio's, Priced as one. The Scalloped Pieces have a Peach and Red Rose Pattern, with Green Foliage. All Pieces are Rimmed in 22kt Gold. This is a very beautiful Rose Floral and would grace any Tea Table, or Dinner Table.